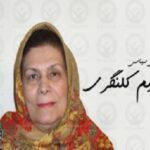 HRANA News Agency – Maryam Kalangari, 65, was arrested by the law-enforcement officers and transferred to the central prison of Arak on January 13. Mrs. Kalangari had already been sentenced to 5 months imprisonment by a court. Three other members of the Kalangari family, Bijan Kalangari, Mojtaba, and Meghdad Fouladi, were sentenced to three years imprisonment each. Kalangari’s family is among the families of survivors of the massacre of political prisoners in 1980s.